In a few weeks my local group will be starting a 1941 Desert War campaign centred around Operation Battleaxe, using the Battlegroup rules and an appropriate map. 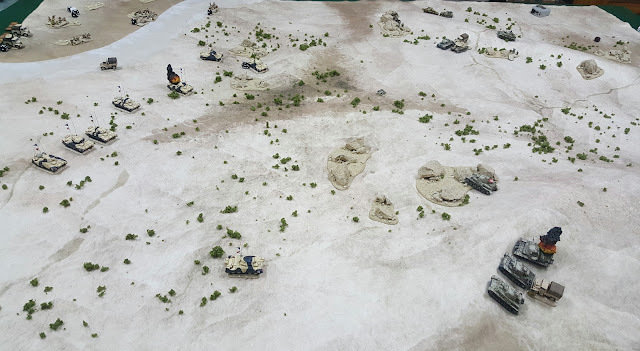 More about that later: in the meantime, my brother has never played a desert game of any sort so what better time to practice? 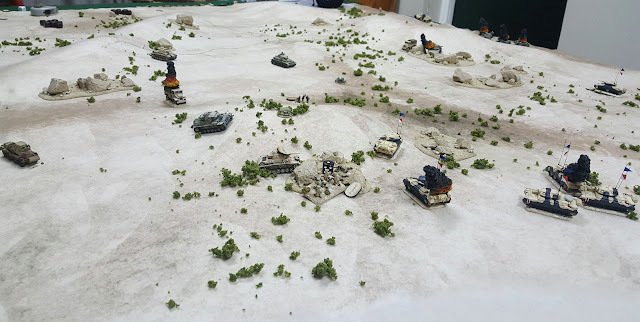 A couple of quick forces were thrown together, my brother opted to play Germans and took the DAK: mostly Panzer III Gs with a platoon of Panzer IV Ds and some Recce (8-Rad, Panzerjager PaK38 and PzGren Foot Patrol). The British fielded Crusaders, two Troops of the Crusader Mk I. (Unreliable) with a Crusader I Forward HQ and additional tank. Also a Motor Infantry Platoon, a single 3" Mortar and a 2-pounder ATG. No Recce as I don't have anything period-appropriate: we're going in blind! 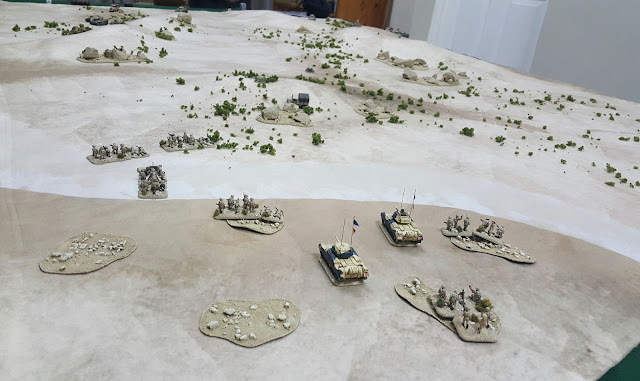 My plan then as the British was an old-fashioned cavalry charge with (hopefully) overwhelming force on one side (which ever looked more promising) while refusing the other with the infantry, 2-pdr and maybe a tank or two if necessary. 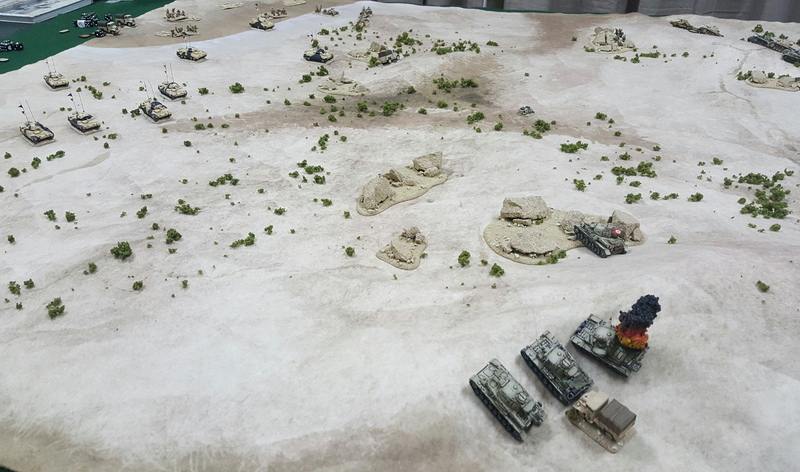 The mission was Flanking Attack....and I got to start in the "this corner is all rocky ground" corner. Lovely. 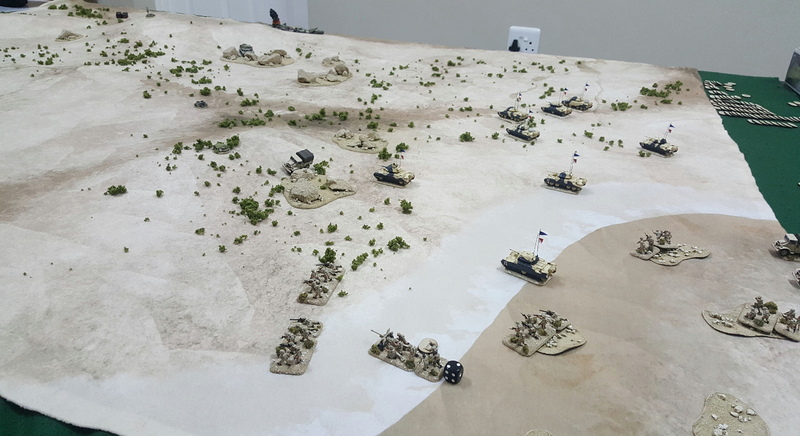 and really get going, thus the Germans were able to take up good positions early on. took a direct hit from the 3" mortar and the crew were wiped-out. Lucky! Panzers on German left in hull-down positions. 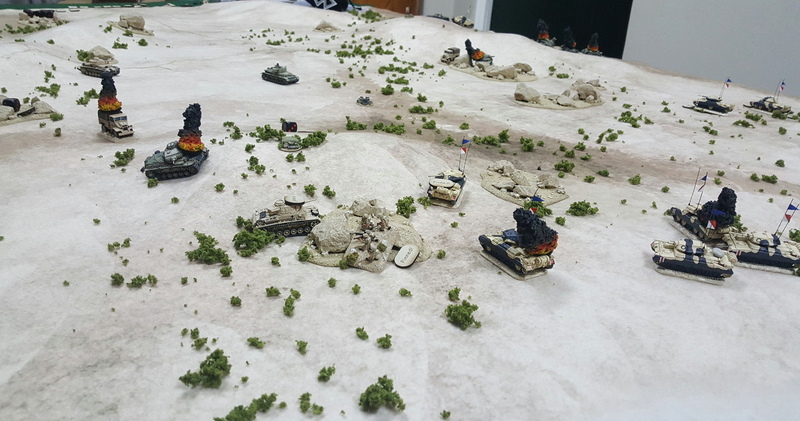 Crusaders come on from reserve and charge the ridge: a lucky hit sees a Panzer III G KO'd. Roll a 6, then roll two more. Simples! The British left: the 2-pounder managed to miss everything all game, but at least *seemed* threatening. ...and has somehow survived the return fire (unbelievable...). Offered a second opportunity for life he now destroys a Panzer III G.
foremost Panzer III manages to hit and destroy the British FHQ Crusader....sad! The Hero Crusader KO's his third Panzer before being Immobilised on a 1 (Unreliable). Now stuck, but the damage is done. The rear Crusader KO's the Panzer IV near the rocks, but is in turn Immobilised (damn Unreliable!). ...because the other (non-broken-down) tanks are needed to counter on the left. 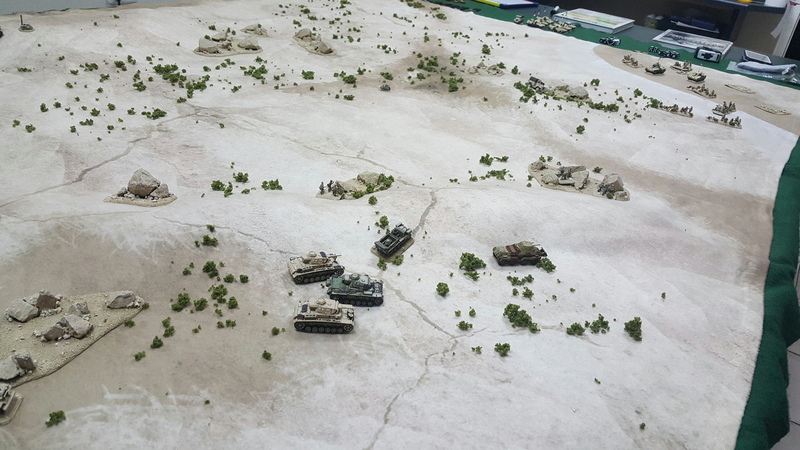 The tank-fight on the left quickly moves to close-range but neither side can hit much of anything. 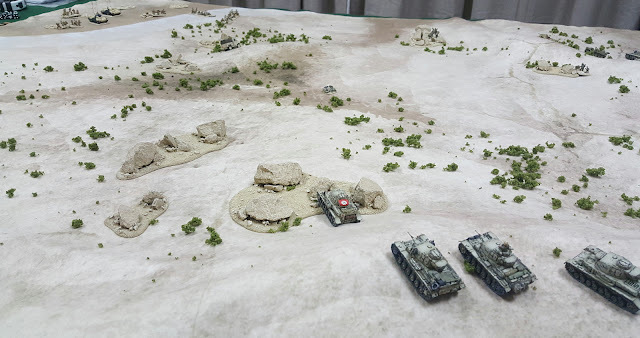 A section of Motor Infantry moves up hoping to Close Assault the Panzer III. 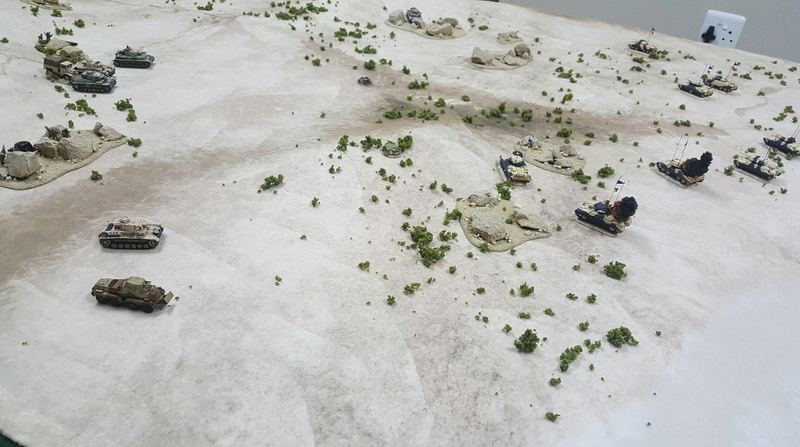 The infantry assault but fail to do damage, lose a man and are pinned. Tank fire is pretty abysmal, only managing to Pin the Panzer III. Long-range Bren and Rifle fire lights-up a supply truck that became a little too bold. 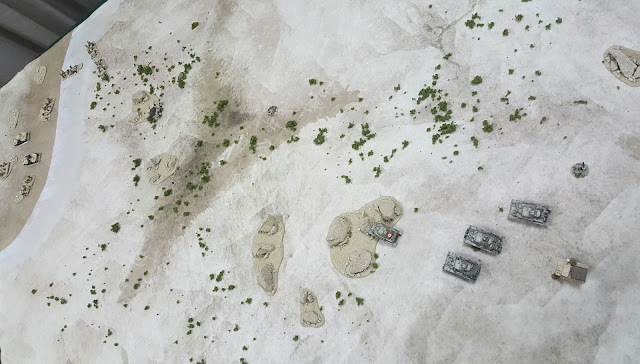 breaking the German force morale. The British were 35/37 BR...so a close game as the Britsh were drawing many 4s. Now done. This is the first 28mm scale vehicle I've done, so still quite a bit to learn but it turned out decently. 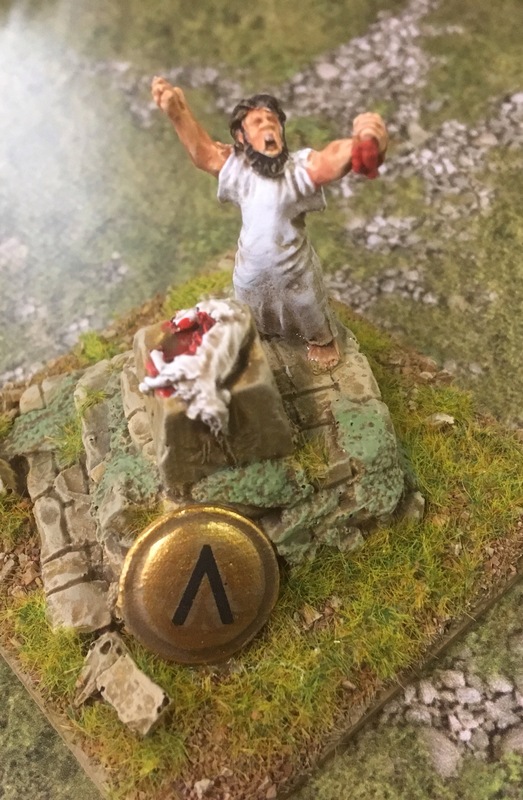 The Warlord model is a little simplified in places, e.g. there are no tools on the vehicles. Apart from that it is a very nice model. Lacking decals for this scale I had to make do with what I had, using mostly larger 15mm decals. Markings for 4. 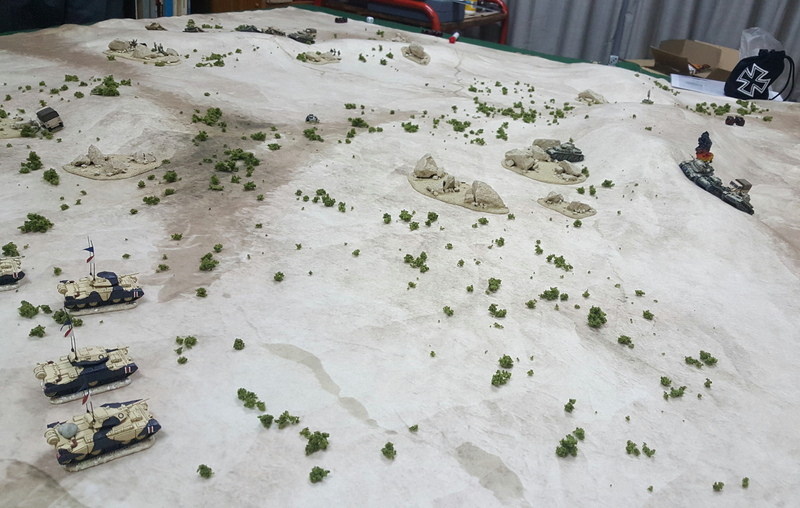 Panzer Division, though the turret numbers are fictitious and I kept the rest very simple. I would have left off the Jerry cans on the turret but I was given the model by a friend and it was already assembled: the Jerry cans proved to be exceedingly well-glued, so they stayed. Warlord 28mm Luchs, Plastic Soldier Company 15mm Panzer III G.
...quite a difference in size. A nice change to paint something larger I must admit. 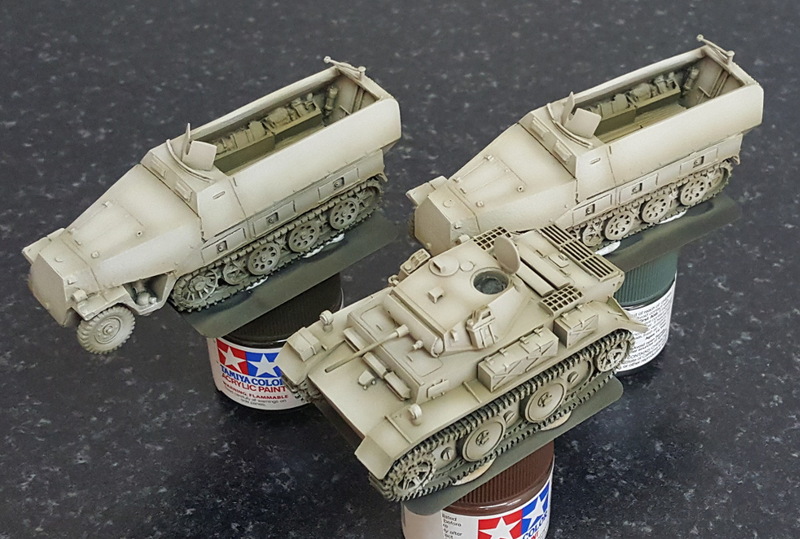 Following on from the Pz III WiP thread, the next lot in the slow DAK build: three Panzer III ausf G. Models by PSC, BF plastic commander. This is what I've done so far, six tanks and a Sd Kfz 10 tow vehicle. Still loads planned, but I need to finish some other things first. 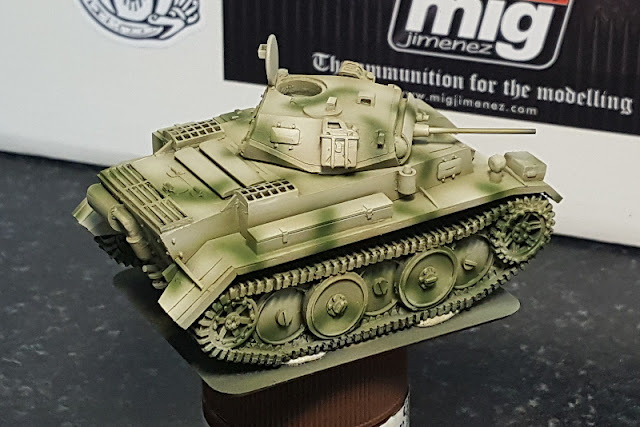 Working on the 28mm Luchs at the moment: a lovely model from Warlord, the only thing I've added was a metal gun barrel. 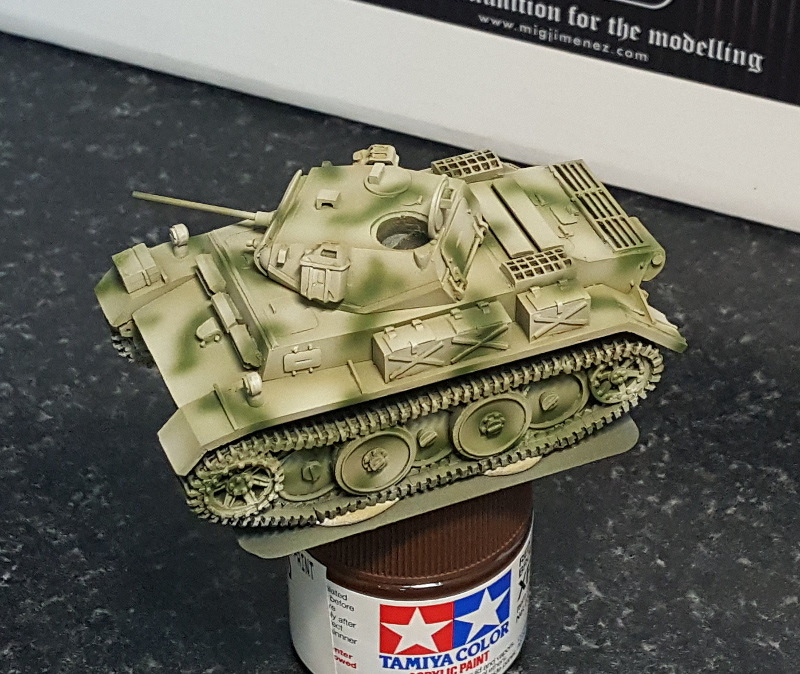 Soft-edged green camo over dunkelgelb, because I like it. Luchs are indeed quite cute. Markings will be for 4. 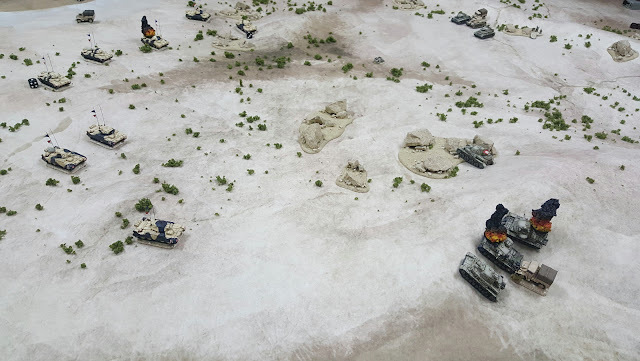 Panzer Div. Still a way to go on this one.